The only thing better than blasting some hockey pucks at the net is having four targets in each corner to really challenge yourself! 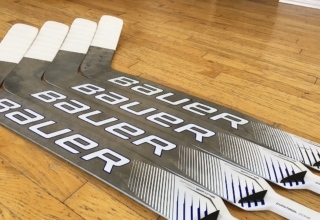 There are a lot of hockey targets out there and all of them vary in price and quality. Today we are reviewing the EZ Goal corner targets. 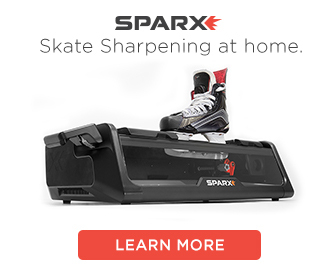 The targets sell for $19.95 on Hockey Shot. 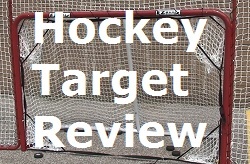 You can also get the targets for free if you buy the EZ goal folding hockey net. The targets have a fairly simple design. There are four triangle-shaped pockets, each connected by a thick polyester strap. 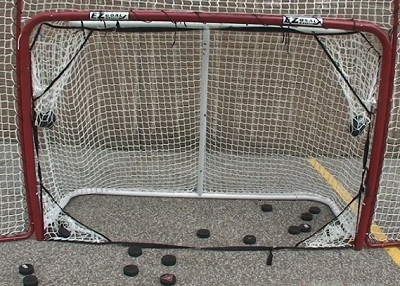 Each corner target has two hooks that should hook into the nets wiggly-wire (the same wire used for lacing the net up). In order to get the targets to fit properly and assume the triangle shape, you must pull the tightening mechanism on the top, bottom, and both sides. 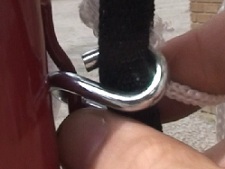 The straps tighten with a simple tug of the rope. There are two materials used to make the targets. 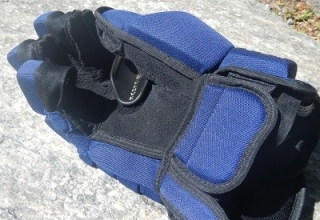 The mesh pockets are made out of nylon and the straps are made out of polyester. 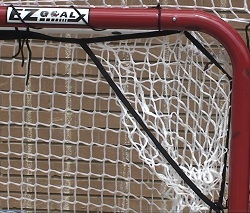 We tested the EZ Goal targets out on the official EZ goal net to give you an idea of how they fit and how well they work. 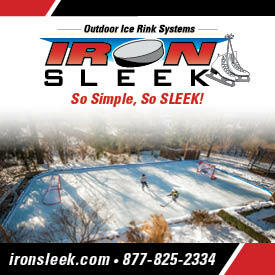 Installing the targets is easy, all you have to do is hook each target into the corner of your hockey net. The hooks attach easily to the “wiggly-wire,” but you can also use strings to tie the targets into place. Each target is connected with straps and once you have each target in place, you simply pull the straps tight to keep the targets in place. 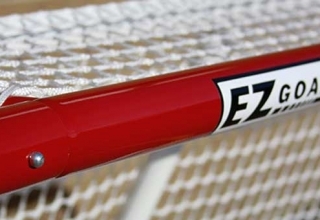 The EZ goal targets fit into any regulation size hockey net, they fit nicely into each corner, and stayed in place while I was shooting. Shooting with the targets in the net was great. The targets fit nice and snug into each corner so if I snipe the inside post the puck will still go in the target, unlike some other targets. The targets have deep pockets so they can hold a lot of pucks. 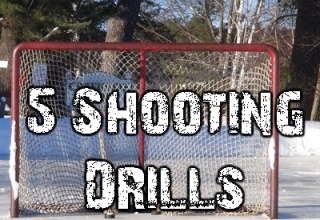 I hit the targets with some hard wrist shots and slapshots and they held up to everything. The targets are made of nylon and I know from experience that nylon meshing will wear-out after extended use so it will be interesting to see how long the targets hold. The only downfall I could see is with the material. I know that nylon wears out after a lot of shooting, so I am going to bet that the targets will have some holes in them after a few thousand shots. This is only a problem if you use pucks, and if you have a good shot, but even then the targets will last for a while. If you are like me you will find ways to patch the holes. The price is great, only $19.95 for FOUR targets! 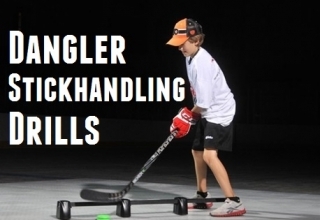 We recommend these targets to anybody who is on a budget, and wants to improve their shooting accuracy, and make shooting pucks a bit more fun. 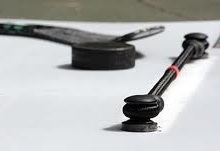 In this video we show you how to set up the targets and take a few shots to show you how the targets hold up to hockey pucks. 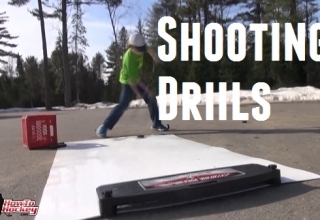 You can buy the targets at Hockey Shot for only 19.95, or get them free with the EZ goal folding hockey net. Sorry about that Jofs, I have sent you a coupon by email.